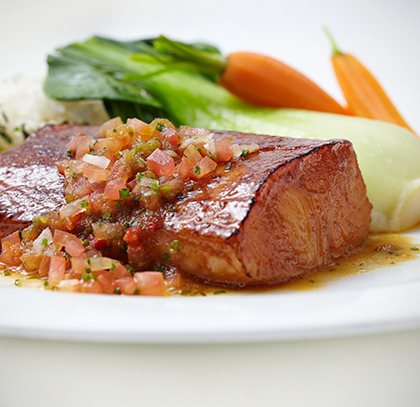 Culinary pioneer Roy Yamaguchi created fusion cuisine at his original Roy's in Honolulu in 1988. Blending classic techniques with adventurous Pacific Rim flavors, he created an entirely new approach to fine dining. Indulge in one of our spectacular cocktails or choose a glass from our award-winning wine list while you discover the fresh local ingredients and outstanding seafood that made us famous. We look forward to serving you. Our local menus are specially prepared by our local chefs, infusing their own creativity and inspiration, while keeping Roy's vision and tradition thriving. These menus change frequently so that we can bring you an ever-changing mix of seasonal favorites and brand new creations. *Consuming raw or undercooked meat, fish or poultry may increase the risk of food borne illness. Enjoy a cocktail mixed with any of our well liquors. *Consuming raw or undercooked meat, fish or poultry may increase the risk of foodborne illness.